The ferry from Cancun to Isla Mujeres is full of tourists from everywhere. The smell of solar lotions is very strong, the sun is scorching and I can’t wait to get there. First of all, I have to meet with Augusta, my friend from Cagliari whom is vacationing there. It’s her birthday today and being able to wish her the best, both of us so far away from home, is something I cannot miss. We need to make another unexpected stop as some tourist were left stranded on a different dock and on the way there I’m fascinated by the colors of the ocean, from bright turquoise on one side to deep blue on the other. We reach our destination about half hour later and we need to figure out soon what direction we need to take. 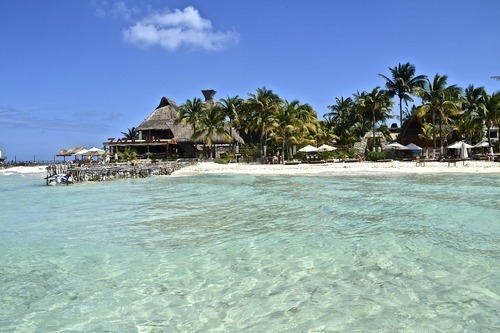 Isla Mujeres is quite small and one can walk through the main village, located at the south side of the island. Now we only need to figure out where the locanda where my friend is staying is. Men do not like to ask for directions, this is so true, and since my Spanish knowledge is limited, I don’t even try to do it myself. I understand almost everything when people are talking to me, but whenever I try to reply, the first words that come to my mind are in English, not even in Italian. We browse around the narrow streets, full of locandas, restaurants and artisan shops. “Sardinian Smile” has something that catches my attention, who knows why!! An older lady is sitting at one of the small outdoor tables smoking a cigarette, so I approach her with the excuse of looking for a lighter. The accent is unmistakable and since Sardinian people living away from home seem to have a deeper love for their country, compare to what it was during the time they were there, I immediately strike a conversation with her. Very simple story: her daughter come here few years ago on vacation, fell in love with the island and decided to come back and open up her own business. Her family was already working in the restaurant industry, so they all come to help during the low season in Sardinia. Not too bad, I think, living in the heat all year round. And I think of the cold long winter in New York and as much as I love my adoptive city, the cold is something I still cannot deal very well with. After a small talk with my fellow countrymen, and a coffee that finally deserves the name of real espresso, we ask again for directions to the locanda. “Go down straight for two blocks, turn left and you’re there”. I have the feeling the two blocks are somewhat like the two Italian minutes: they could be ten, thirty o even one hour, according to the circumstances. Hence, we can’t find this locanda. I work my magic to convince Gianluca to ask somebody again. I think he grew tired of my mumbling about how stubborn men are, about the fact they don’t like to admit they got lost and so on, that finally he listens to me. Augusta and her friends are recovering from a very bad cold. Let’s say this is not how they planned to spend their vacation and they are not really cheerful at this point. I wish her happy birthday but after a while inside their hotel room, I start to feel claustrophobic. “Honey, I love you but I have to get out of here. I need to breath fresh air”. We walk toward the extreme south of the island. There’s no wind, the sand is so white that the reflection of the sun is almost blinding, that I can barely keep my eyes open. But I’m looking at a picture perfect dreamscape. That’s it. The ocean and I have a long lasting love relationship, a love I will always cherish and be faithful to, for better and for worse, for richer and for poorer, in sickness and in health until death do us part. Amen. When we turn around the corner of the extreme south, the landscape changes completely in front of our own eyes. The rocks replaced the soft sand and the wind is definitely stronger here, perfect place for windsurfers and parasailing lovers. We decide to go back to town and rent a vehicle to drive all the way to the north and back. Gianluca would like to get a motorbike but I, the drama queen, already envisioning myself spread on the asphalt wearing only a t-shirt and shorts, choose a golf-cart instead. The only inconvenient about my choice are the suspensions. The problem is they do not exists and I fear I will get thrown out of the car everything we hit a bumper on the road. But I start to feel better when I think that his way one can take moving pictures, while the other drives at the dangerous speed of ten miles per hour. Let’s just hope we won’t find a bump right at the some time I’m shooting. The farer we go from the village, the barer the land becomes, but there are gorgeous villas along the coast, some of them right on the cliffs, and I dream to have a place like this one of these days. Not that I could live here all year round: I need to hear the noise of the cars, the smell of fresh coffee coming from the shops, the hot-dog vendors at every corner and people chattering around me. But again, a place like this will be perfect to get away from everyday routine once in a while. We bring the lethal weapon (the golf-cart that is) back to the rental agency and see our ferry is ready to go back to Cancun. My skin feels crunchy because of the day spent in sun, but I feel so blessed for the chance I had to discover another small corner of Heaven.